I love that Chloe loves pink. Bria doesn't care for it at all, much like I didn't as a child. Chloe would wear pink at every opportunity and when Mamah got these shoes for her, they had to be pink. 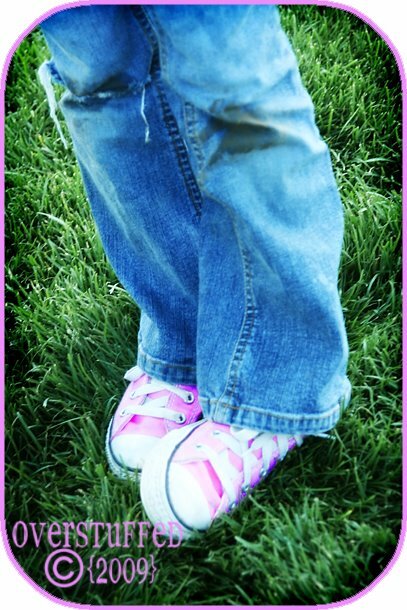 I love that the girly pink tennies are worn with grass-stained, holey kneed jeans. Just goes to show that she is a well rounded child. We have the most adorable photo of my two oldest girls wearing pink converse hightops with fancy flower-girl dresses. My second girl swears that pink is NOT her favorite color, but if not, it certainly is her go-to color. Only this past year (closing in on 13) has she consistently been eyed not wearing pink. Up until now, it didn't matter the day of the week, she wore pink. My youngest is the same way, only she'll admit to liking it. I was like you, not such a pink girl. I have pink tennis shoes too! Soooo cute! P.S. Thanks for stopping by my blog! We love meeting new bloggers. I will be sure to return here again! PINK shoes!! So cute!! I dont know about the whole "white" tennis shoes!! They would be ruined in a day here!! so cute though! Those are so adorable. I love a girly girl! I have a girly-girl too! She is so much fun - still! and she's almost 12! I want those in dark purple. seriously, what's up with the house. I think of you often. Very nice... None of my girls really wanted pink either, J went through a phase in AZ but not long.